Silk Sleepwear Camisole "Tiffany Butterfly"
This lovely silk Camisole Top comes has a modern floral print in Champagne, Heather, Aqua and Coral. 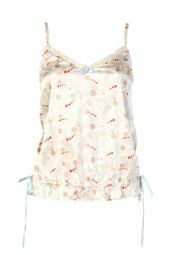 In stretch silk, this Camisole is gently gathered at the bottom, and features two long and feminine bows in Aqua colour. The top is edged with guipure lace, an Aqua bow and a discrete enamel Ted Baker motif. The straps are adjustable. 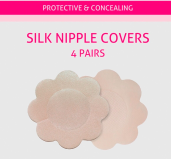 Materials: 95% Silk, 5% Elastane. Machine washable.